A passion for story and language, has Haida artist Gwaai Edenshaw using his knowledge of Haida stories to help find the hidden within ourselves at the new exhibit Godanxee’wat: Stone Ribs showing at the Bill Reid Gallery (Jan. 12 until Jul. 5). Edenshaw – who apprenticed with Bill Reid when he was 16 – also incorporates the legacy to help people in their contemporary lives. After spending seven years carving a totem pole on a Yellow Cedar, Edenshaw has now embarked on a journey to dig out the truth of the Haida oral stories and help teenagers discover their true selves through experiencing these stories. Edenshaw’s totem pole has been cast into bronze in the current exhibition at the Bill Reid Gallery in downtown Vancouver. “Bronze is more durable,” says Kwiaahwah Jones, curator of the exhibition, suggesting the long-lasting material symbolizes the resilience and strength of the Haida legacy. Edenshaw started to carve the oral stories he found during his research into totem poles. Anyone familiar with the Haida culture can get the story by seeing Edenshaw’s totem pole, says Jones. The exhibition includes seven editions of the cast totem poles, which contains the mythical characters from Haida culture. The final color of the patina was chosen to reflect the famous polished black argillite carvings, exclusive to the Haida. Each pole is 8.5 feet tall, 16 inches wide on the base, and 300 pounds in weight. Stone Ribs, one of the strongest supernatural beings featured in Haida oral history, is featured on the poles. A cultural hero, Stone Ribs saved the people in the Southern village of Hlgaadaan on Haida Gwaii from the terror of Kaa’Gwaay, a five-finned sea monster. Godanxee’wat in the Haida language means someone finding the hidden things within themselves. “These hidden things are held dearly within people, and we [who practice a certain Haida culture] are helping people discover their hidden things and come to realize who they really are,” says Edenshaw. The first thing Edenshaw did was to get the story right: he found out some anthropologists’ account of the Haida stories were inaccurate. While researching various sources he found more reliable information, including an early record of Haida oral stories from the 1910’s as well as the personal record of Edenshaw’s grandmother Diane Brown. “Haida cultures have an issue of contact. A lot of time they are taken out of context,” says Edenshaw. Edenshaw will be part of the world-renowned Rediscovery Program, a two-week training camp for teens and pre-teens run by Haida Elders. In the program, which has been in place for 35 years, participants are required to disconnect themselves from all the distractions of modernity for the duration of the camp. They are taught essential skills for survival in the forest, such as building a shelter and gathering food. Towards the end of the camp, each participant is expected to meet the ultimate challenge and survive alone in the wild for 24 hours, with few necessities: a few potatoes and three matches, provided to them. Those who are able to complete the program are given the name Stone Ribs. It is a moment of very high honor and includes receiving ownership of the story of Stone Ribs. 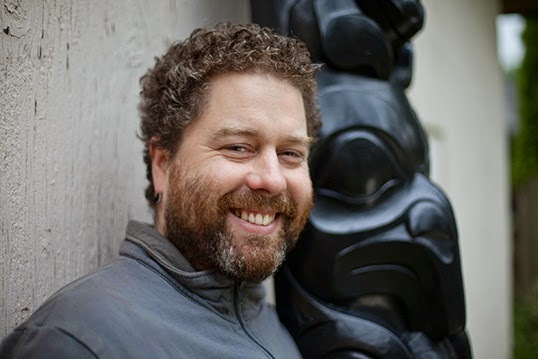 Edenshaw sees the Rediscovery Program as a means to reconnect the culture and the land; and sees his bronze totem as a way to consolidate the Haida culture in context. “Edenshaw brings together his personal experience with Haida Gwaii Rediscovery, Haida oral history, and classical Haida carving expression to present this beautiful continuum of storytelling,” says Jones.